not a great combination if you want healthy apple trees! 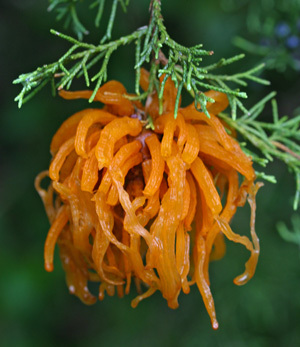 A mature cedar-apple rust gall erupts into mass of bright orange tendrils after wet weather in the spring. The other day as I was driving to work, I noticed those dreaded bright orange growths clinging to the branches of many of the cedar trees in the area. Some trees had quite a few of these odd looking structures on them. They look like something out of a sci-fi movie with their fleshy, neon orange “tentacles” protruding out of and completely covering a hard kidney-shaped mass. 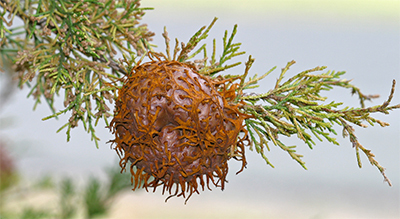 These funny-shaped growths are the galls of cedar-apple rust, a fungal disease that requires two hosts to complete its life cycle; Eastern Red Cedar (Juniperus virginiana) and the alternate hosts, primarily apples and crabapples (Malus spp.). This cedar apple rust gall has released its spores already and the tendrils have begun to shrivel up. 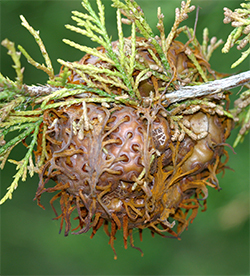 The brown galls which form on the cedar branches begin the cycle. When they mature after about two years, they “sprout” gelatinous orange tendrils during rainy weather in the spring. These tendrils release fungal spores which infect the leaves and twigs of susceptible apple and crabapple trees. After the spores germinate, the fungus grows causing yellow spots and rusty lesions on the apple leaves. Eventually in the late summer, these lesions produce spores on the underside of the leaves. These are the spores that will re-infect the cedar trees to start the cycle over again. Cedar apple rust spots on the leaves of a hawthorne. Courtesy of Missouri Botanical Garden Plant Finder. 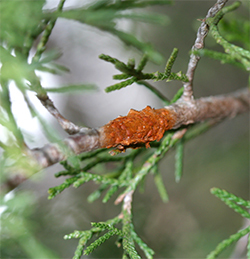 Cedar-apple rust normally doesn’t affect the health of the cedar trees beyond some dieback on the branches where the galls are growing. It’s the apples and crabapples that get the raw end of the deal. With severe infections, much of the leaf surface can become covered with the rusty spots. This can inhibit photosynthesis and also result in premature leaf drop. Eventually the tree may weaken and could even die. 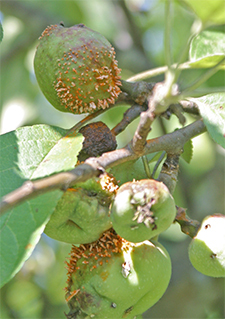 Cedar-Quince rust is another dual host fungal disease which is associated with Eastern Red Cedar. You can prune out the galls that appear on the cedars and junipers in your landscape but this really isn’t very effective because like pollen, the fungal spores can travel for long distances on the wind and your apples and crabapples could still be infected from cedars located miles away. The best solution is to plant resistant varieties of apple and crabapples. There are loads to choose from. 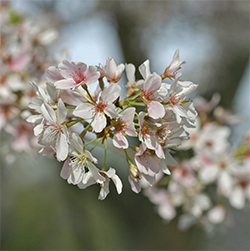 Andre has compiled a list of his favorite disease resistant crabapples. If you have existing trees that are susceptible to rust, you can apply an appropriate fungicide to reduce the incidence of the disease. It is critical that the fungicide is applied before the tree is infected which means spraying should begin as soon as you see the fleshy tendrils growing from the galls on the cedars. Once the symptoms appear on the apple trees, fungicides will not be effective. When the tendrils on the galls have shriveled up and dried, fungicide applications are no longer necessary. Suggested fungicide is Bonide Liquid Copper. Always read and follow the label directions and if spraying fruit trees be sure the fungicide is listed for use on fruits and vegetables. This bumblebee was working the flowers on the Japanese maple. I wandered around the yard with my camera this morning looking for signs of spring in my gardens. They weren’t hard to find! Everything is beginning to pop. Even “Cousin Itt”, my Japanese maple, is in flower and beginning to leaf out with its tiny, velvety red, baby leaves. I spent a little time watching a bumblebee buzzing from flower to flower collecting nectar and pollen. 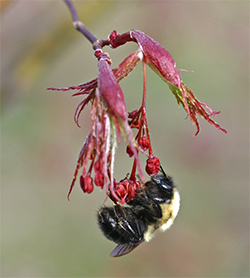 It’s interesting – I never thought of bees as pollinators for maples before. The cherry blossoms are beginning to fade but are still beautiful. The cherry tree at the foot of the driveway is gorgeous now. It started blooming with snow white blooms a couple of weeks ago and now the flowers have matured to a beautiful blush pink. So pretty! They won’t last much longer though because as I was photographing them, it was literally “snowing” cherry blossom petals. Redbuds are so beautiful in the spring. 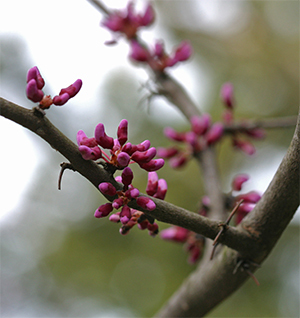 The redbuds are in bud and about to open as are the native dogwoods in our woods. The bracts surrounding the dogwood flowers are beginning to unfurl and soon the woods will be bathed in bright layers of white. I can’t wait! My large tree peony is also in bud. I always look forward to those giant white blooms. They are just spectacular in May especially at night when they reflect the moonlight. We planted a few more tree peonies in other gardens around the yard and I am hopeful that some of these will bloom this year. We’ll see – we planted some really cool colors! Peach blossoms! Hope we get lots! I also noticed as I was walking around that the last of the brown leaves have been pushed off the oaks as their new buds have begun to swell – another sure sign that spring is here. Time to get my rake out again! 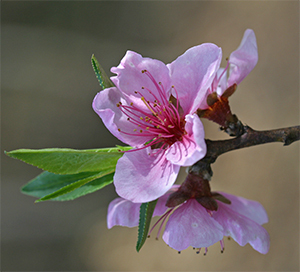 Up in the orchard, the peaches are in bloom and the apple trees have tiny leaves and tight pink flower buds. The blueberries are loaded with blooms, too, so I’m hopeful that we will have a great fruit crop this year. 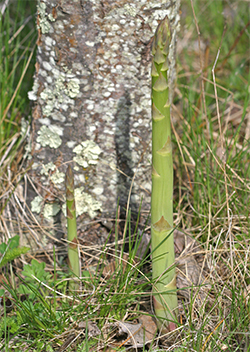 Mmmmm - wild asparagus is growing under one of our apple trees. Here’s hoping we won’t get a late freeze but the long term forecast looks pretty good right now. 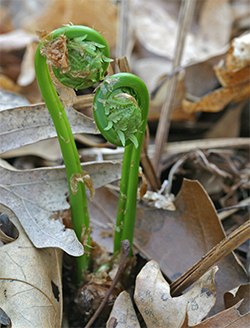 In our woodland garden, the fiddleheads of the ostrich fern and many of our other ferns are poking up out of the leaves and the mayapples are beginning to carpet the ground. The early flowering PJM rhododendrons are in full bloom and the later ones are just now budding up. I love these hardy rhododendrons; the flowers are so bright and cheerful and they seem to last forever. What a beautiful sight out my kitchen window in the spring. This is such a wonderful time of the year with everything coming up fresh and new, and full of the promise of the exciting season to come! Fern fiddleheads are so interesting! 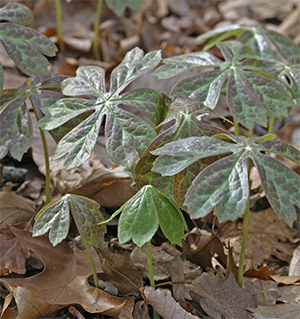 Mayapple carpets the woods in the spring. 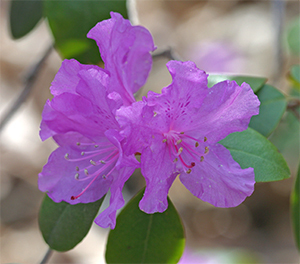 PJM Rhododendrons are hardy and very floriferous! Patches of wild onions have popped up throughout my lawn - or maybe they're wild garlic? No – I’m not talking about the onions you purposely grow in your garden; I’m talking about those annoying wild onions that pop up in your lawn every spring. Each clump is actually comprised of many small bulbs growing together. 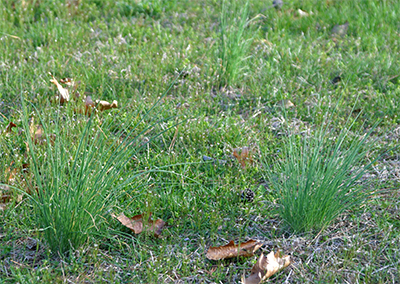 They break dormancy early, much earlier than your grass wakes up from its winter nap and consequently, they are quite obvious in the lawn, standing out against the brownish winter grass. This is what drives some gardeners bonkers. Once they start in the early spring, they grow very quickly and soon these tufts of bright green wild onions reach 6″ to 10″ tall making your lawn look quite unkempt and scraggly. I say wild onions, but these could also be patches of wild garlic. Both wild onion and wild garlic are cool season perennial weeds that come up each year from small bulbs similar to the onion sets that you plant in your vegetable garden. If allowed to flower, they produce seeds which fall to the ground and germinate. This is more likely to occur when they are growing in the garden, though, not in the lawn. The patches that grow in the lawn are normally mowed down before they get a chance to flower and set seed. Ahhh, the fragrance of fresh mown wild onions! 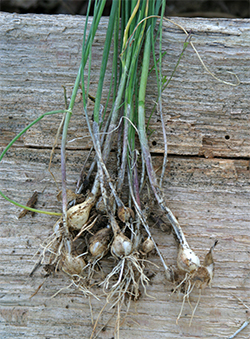 Wild onion and wild garlic grow from bulbs. One clump may be made up of a multitude of different sized bulbs. So they’re in your landscape and you want to get rid of them – what can you do? Pulling them doesn’t work because invariably you just end up breaking off the top and leaving the bulbs in the ground to come back up the next year. Been there, done that! The most environmentally friendly way to “try” to get rid of them is to dig them out. You have to be very careful to get all the bulbs in the cluster including the roots and any tiny bulblets that have formed off the main bulb. This is a bit easier in a garden than in the lawn but is usually not a very effective way to control them. A digging tool like a dandelion digger makes the job a little more successful but it’s really hard to get every bulblet. If you are set on digging them out, do yourself a favor and irrigate the lawn and garden first or wait until after a good soaking rain. This will soften the soil and make it easier to pull out the entire cluster of bulbs. 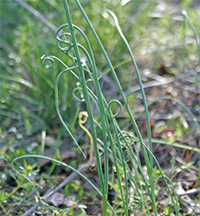 In the lawn, wild onions and garlic are unsightly for a few weeks in the spring but once you mow and the grass begins to grow strongly, they blend right in and by late spring they go dormant and disappear anyway. Mowing slows them down especially since it keeps them from flowering and setting seed, but they will still grow back from the bulb the following spring. The blue-green onion foliage really stands out in the lawn! 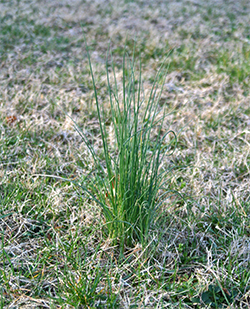 If you can’t stand them in your grass and digging them is not feasible, you can spot treat the patches of wild onion/garlic in your lawn with a selective broadleaf herbicide like Clear Choice. Spot treating is more environmentally responsible because you are targeting the specific problem with less herbicide and very little wastage. There are other selective herbicides that are listed for use on wild onion and wild garlic – check the label to be sure. Always read and follow the label directions when using any pesticide. Remember, one of the best ways to fight lawn weeds is to keep your grass thick, lush, and healthy through proper feeding, watering, and mowing. Here are some tips from the Viettes.